Renault Trucks’ Range T High scooped the double at the 12thFleet Transport Awards, winning both ‘Irish Truck of the Year 2019’ and the ‘Flagship Tractor-Unit’ awards. Both trophies were presented to Carlos Rodrigues, newly appointed Managing Director Renault Trucks UK & Ireland, and Harry Nash of Setanta Vehicle Sales, Renault Trucks’ Irish representatives, during the Fleet Transport Awards Gala Banquet at the Citywest Hotel, Dublin, attended by more than 950 representatives from the road transport industry. Selected by an independent judging panel of industry experts, the Range T520 High fought off a strong challenge from leading manufacturers to win the ‘Irish Truck of the Year 2019’. The judges acknowledged the Range T High’s additional interior space thanks to the flat-floor that is appreciated by the long distance driver and noted that since the arrival of the vehicle in right hand drive in 2017, it has been welcomed by international hauliers in the UK and Ireland. While the Range T has been the recipient of several major awards since its launch in 2013, including Irish Truck of the Year for two consecutive years in 2015 and 2016, this is the first such accolade for the Range T High in right hand drive with fully flat floor. 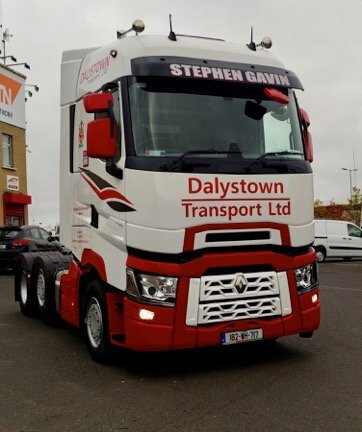 Pictured is the latest Irish customer to purchase a Range T High – Dalystown Transport (Mullingar, County Westmeath) has added another T-High 520hp 6×2 tractor unit to its fleet.